I quit singing and turned down the volume as I rolled up onto a red light where a police car was in the other lane. Trying to stay looking forward, trying to act nonchalant, but I can feel the eyes crawling over me, trying to see what I’ve got. The light turned green and I rolled forward but the cop stayed motionless. It was creepy. Started thinking about that Stephan King story “Desperation” where there is a Sheriff that has been taken over by an ancient evil spirit. Driving through the desolate Arizona desert alone with a insane Sheriff who wants to tear your soul out is worse than death. The cruiser had it’s high beams on and was tailgating me. I began to start sweating and rolled down the windows but was unable to turn the steering wheel to pull over. 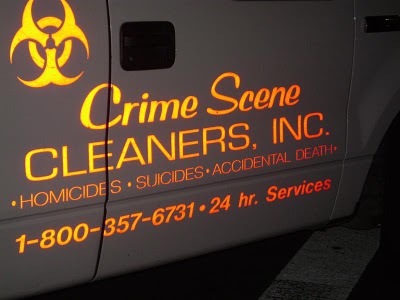 I work at Biopro, as a dead body clean up and crime scene cleaning service that includes odor removal due to body decomposition, disinfection and more. I put on my water-proof plastic covered paper suit and tape up at the ankles and wrists so no cockroaches enters my disposable cleanup suit.